results got declared, 74,307 aspirants qualified from Engineering stream is eligible for counseling. Out of a total of 1,03,398 examinees attended, 39,512 male candidates and 34, 795 female candidates made it through the 2014 entrance exam. Now the department has publicized the notification regarding the mark submission which would intern lead to the final declaration of the rank list. As the Engineering Rank list 2014 is being prepared by giving equal weightage to the marks obtained in the Entrance Examination for Engineering (Paper I & Paper II put together) and the grade/marks obtained in the Second year of the qualifying examination (Plus Two or equivalent), students who have qualified in the Engineering Entrance Examination 2014 should submit the marks obtained for Mathematics, Physics and Chemistry in the Second year of Plus Two through, www.cee.kerala.gov.in the official website of KEAM. For those students who have not studied Chemistry, the marks obtained in Computer Science will be considered. But in the case of those who have not studied Chemistry and Computer Science, the marks obtained in Biotechnology shall be considered. While for those who have not taken any of the three subjects, the marks obtained in Biology will take into consideration. As per the procedure, the marks thus submitted by the candidate will be processed only after completing the standardization procedure for preparation of Engineering Rank list. 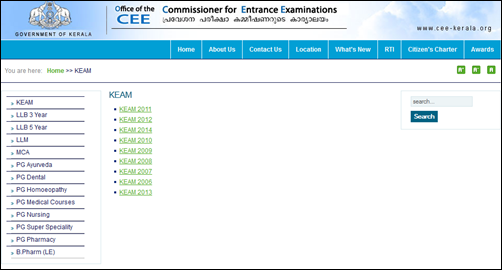 The official website of KEAM will be opened from 20.05.2014 to 02.06.2014 for the online submission of marks. Candidates should have to enter the basic details including their Application number, Roll number, Key number and password to get access to their home page. The details of Second year marks will be displayed when submitting the Examination Board, Year of passing and Register number of the candidate on the web page. Candidates have to verify it with the original mark sheets. If the marks data is not available, candidate should have to enter the marks secured for the Second year. After the process of verification/submission of marks, all candidates should take the print out of the marks submission data through the link 'Print and Finalize Mark Data Sheet'. The print out of mark submission data which is duly signed by the candidate along with the copy of Plus Two mark sheets attested by a Gazetted Officer must reach the Office of the Commissioner for Entrance Examinations on or before 5 pm on 02.06.2014. As per rules, those applicants who do not submit the marks online and those who have not forwarded the print out of the marks submission data along with the self-attested copies of the mark list of the qualifying examination will not be eligible for consideration while during the preparation of Engineering rank list 2014.